The mentality of fintech startups has shifted from a combative, "down with the banks" position to a more complimentary view of the banks. Startups realize that the banks can be necessary partners and sometimes good customers. At Bank of America Corp.’s annual Technology Innovation summit each fall, around 16% of the more than 230 startups that have attended went on to sell their services to the bank. “It’s too simple to say all these banks are stupid,” says Qasar Younis, a partner at the Silicon Valley seed fund Y Combinator. 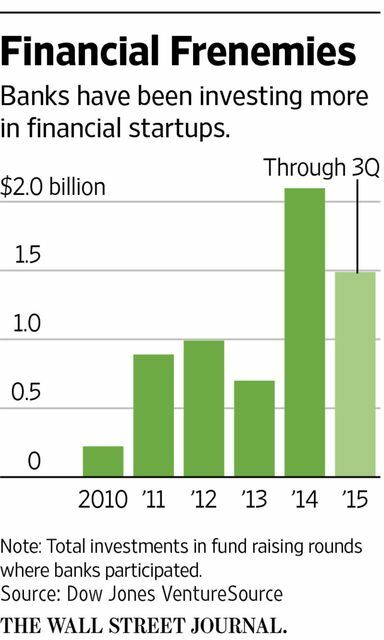 Some fintech firms, though, remain skeptical of bank overtures. Lenda has turned down banks’ offers to invest in the company, instead picking backers that include venture firms Winklevoss Capital and 500 Startups. Many of the firm’s 12-person staff had their own bad experiences working with banks before the crisis. Other fintech executives are concerned that banks will join with startups long enough to steal their ideas and then eventually stifle their business prospects.